Hammer corals are one of the most beautiful corals known to man. Their colorful tips, multiple shapes and ultimately anemone like looks are all reasons to bring these home. With the right care, home aquariums can see their new hammers forming new heads. In the end that’s what every coral owner loves. Growing corals. With that being said let’s learn how to grow hammer coral! Just as “cat” is not an exact term, hammer coral covers a wide variety of genus. For simplicity sake we will discuss these as both wall and branching hammer corals. Remember your hammer coral placement will depend on which kind you get and how much you are starting with. Wall hammer corals are more suited to those looking for slow controlled growth. Again with our emphasis being on growth I suggest you pick out a branching hammer coral. These grow by producing new heads. As each new head grows your coral will be able to grow even faster, making the coral growth exponential! So why can my hammer coral frag explode into a colony in just a few months? Lets find out right now. At night hammer corals can extend long tentacles called “sweepers.” These will protect the hammer from encroaching corals, allowing the hammer to sting other corals. The last thing coral growing hobbyists need is coral on coral violence. I don’t mean turn your tank into a stagnant pond. These corals do best when a mild flow is reaching them, allowing the tentacles to sway in the current without being blown around forcefully. Too much flow will give your coral a dying look, either by stress or actually dying. Keep the flow down and let it gently bob in the water. Corals are highly dependent on photosynthesis to create their food and energy. Unless you own the strongest aquarium lighting known to man you should not be able to burn these corals. My success has been with fairly strong lights, typically sitting above 150w T5 lighting. You can calculate your own using 7w per gallon. They will survive under less, but your growth rates will slow drastically under medium-low lights. If you’re using Kelvins try to get 10,000k or above. Higher than 10,000k makes the corals look nice, but 10,000k will give you the best strength per watt. If you only want growth, you can choose a 6700k light for extreme efficiency, however the light will be fairly yellow. This is where your actions decide if it takes 3 months or 3 years to double your corals size. Specifically and simply, I have had so much success dosing my hammer tank with calcium dosing that it’s become a money farm that more than pays for itself. Luckily the easy to use C-Balance on Amazon is also the most consistent performer in my hammer coral tanks. More on dosing later. Hammer corals use calcium, and to a lesser extent magnesium, to build their skeletons. After building the skeleton their membrane can then expand and form a new head via splitting. Be sure not to skimp on calcium, but don’t over dose. If you have been following along with the above steps it will be necessary to feed your coral. Why is this when corals can grow just fine without having food brought to them on a silver platter? As corals feed off of 75% photosynthesis and 25% phytoplankton, with the right parameters their growth will actually be hindered by lack of solid foods, not time or trace elements in the water. This will also have it’s own section further along. With all this excess food and supplements going into your tank the water can get a little dirty. Some corals actually prefer a dirty tank that allows them free access to more food. Whether you want it clean or slightly dirty, too dirty a tank will of course kill your corals. Keep an eye on your calcium, nitrates and salinity levels as you watch your corals grow. You’ll want calcium to be between 400-420ppm, nitrates low and salinity between 1.024 and 1.026. Despite their bubbly appearance, hammer corals are not sponges. They cannot grow through water and salt alone. Even reef salts with added nutrients can only help a fragment of what we are looking to do. Again my tanks live and breathe from C-Balance as it provides the two main factors we need to control for optimal growth. Calcium and alkalinity. First off, hammer corals will grow at a much higher rate when provided with higher calcium levels, sitting around the 400-420 ppm range. This is a major component of your hammer corals structure. Even the most powerful reef salts will only provide a small amount of calcium to your tank. This is why most owners will go years before seeing their first new head budding out of the corals. Next on the list is raising your alkalinity to the 8-12 dKH range. This will make your coral much more comfortable and wiling to eat. Keeping this level high isn’t too difficult, and raising your salinity, within reason, will allow your alkalinity levels to stay higher longer. With the water set up perfectly, our corals will be slowly take in the nutrients in the water and begin their growth. As with human muscles, corals will not be able to grow much without being supplied excess nutrients. This can be done two ways, the second far more effective than the first. Using a variety of methods, we can put the food exactly where we need it. Lazy crabs, picky mandarins and unmoving corals can all benefit from target feeding. For my hammers I’ve taken to shutting off the power heads, sucking in thawed mysis shrimp into a turkey baster and very gently spraying the hammer with the shrimp. The corals can only eat so much, so please don’t cover your single head of hammer coral in 50 shrimp. Just 1-3 per head will be far more than they would usually catch on a normal day. While this may seem like barely feeding your mind will change when your coral doubles and you have 10 hungry heads to feed. Clean out any excess food before turning your power head back on. Feeding is done. You’ve likely noticed just how soft hammer corals are by now. While it is true they can go on the offensive with chemical attacks they do have predators. The most common culprit? Peppermint Shrimp. Commonly used to fight algae and aiptasia, these hungry shrimp are no friend of soft, brainy corals. While they are registered as reef safe, they should be seen as “with caution”. Their hard shells protect them from the corals chemical attacks, and the slow eating of the coral attracts the shrimp to steal food from the coral. This drastically slows your hammer corals growth. When they get hungry and scout your hammer corals for food and come up empty handed, peppermint shrimp can resort to eating hammer coral! For this reason I urge you to banish any peppermint shrimp you may own to the sump or donate them to another tank. They are nothing but bad news for hammer coral. That about does it for both wall and branching hammer coral care. Be sure your keep your water parameters safe for aquatic life. Keep the calcium levels up along with your alkalinity, Feed the corals and watch them take off. Pretty soon you’ll need a fragging guide to split your coral and either sell it or start another body! 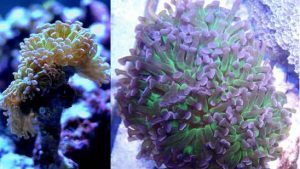 Hello, thank you for this post, it has been very helpful as I am a new hammer coral owner. I do have a question: I have caught my CBS picking at the bone base of my branching hammer coral; do you know of cases where CBS are a danger to coral? I did not catch the CBS picking at the polyps but it still seemed aggressive enough yanks on the bone base to cause worry. The coral banded shouldn’t be harming the coral. Most likely he is investigating the new object in the tank. If it came on a rock there may be some die off near the bone base, which the coral banded shrimp would pick at. This could be the aggressive pulling you are seeing, which is just the shrimp trying to pull food off the rock. I would keep my eye on him, But I doubt he is harming the coral.